This page gives some details on the my (Malaysia) TLD DNSSEC outage from June 15 to June 16, 2018. The outage began with a DNSSEC delegation to an orphaned, revoked DNSKEY and a ghost DNSKEY. Half a day later, at around 2018-06-15 20:14:01 UTC, all RRSIGs were removed from the .my server at 194.0.1.30 (check logfile examples at the bottom) and others followed. However, the DS from . to my remained, thus maintaining the DNSSEC outage. Then around 2018-06-16 01:44:11 UTC, a pile of bogus RRSIGs were added to the zone (because why not). 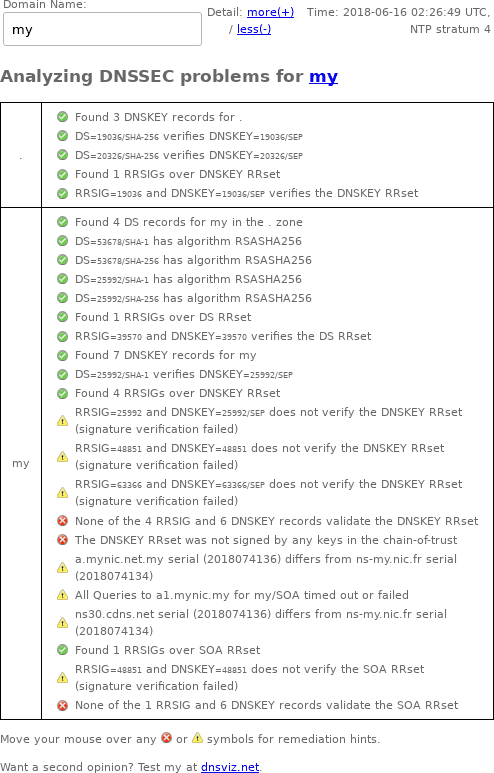 Check the DNSViz links and the DNSSEC Debugger screenshots for visual descriptions of the issues. Later still, the .my administrators added a bunch of bogus RRSIGs to the domain and let them marinate for about 4 hours. thestar.com.my reported that "All Malaysian websites whose addresses end with the ".my" domain, including The Star Online, will be experiencing difficulties after the domain registrar was hit by a technical glitch." 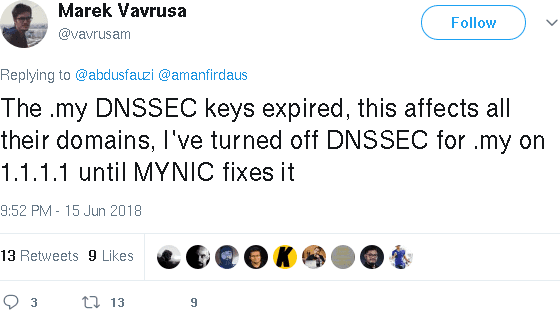 lowyat.net reports that "[Update] 4.50am – MYNIC confirms via a tweet that they are experiencing technical issues with their DNSSEC chain." 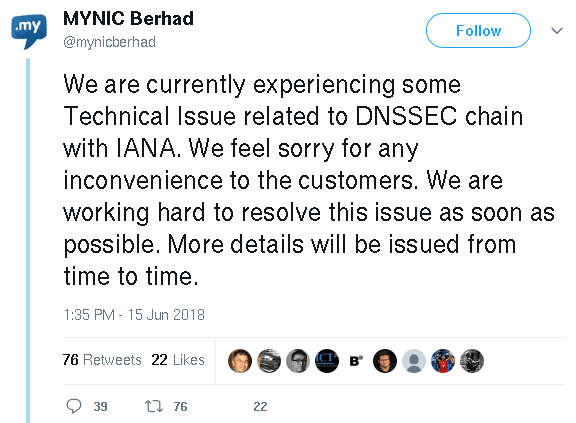 malaysiakini.com reports ".my domain outage, report urges caution when banking online"
freemalaysiatoday.com writes "The ".my" address registrar, MyNIC Berhad, said the problem lay in "some Technical Issue related to DNSSEC chain with IANA", a reference to a chain of security certificates used by domain name servers linked to IANA, the internet's governing name authority."